Frequent use of spray conditioner may be needed to restore moisture and. Spray conditioner should be worked through the hair with a wide toothed comb. Spray conditioner is a haircare product that is designed to moisturize and strengthen hair follicles. It is typically sprayed directly on the hair and combed through with a wide-toothed comb. Most of the time it is left to soak into the scalp without being washed out. It may also be sprayed on only one section of hair, prior to using a heating appliance, such as a curling iron. This type of product normally comes in a pump-type spray bottle. It is usually thinner than a traditional hair conditioner that is used after everyday shampooing. It is sometimes made of sunflower oil, and often has a light fragrance to it as well. Different types of spray conditioner are available for deep conditioning, styling, or adding volume. As a rule, the varieties used for deep scalp and hair follicle moisturizing are somewhat thicker than other types of this product. Spray conditioner used for styling purposes is usually a fine mist sprayed on the hair only, and not the scalp. Styling conditioners can sometimes counteract the effectiveness of other products, like mousse or gel, so a user may want to avoid using these, if she would like to condition her hair. Normal hair conditioners can sometimes be used to make a spray conditioner. This can be accomplished by placing one part of the traditional type, to five parts of water, in a spray bottle and shaking well. An empty hairspray or leave-in conditioner bottle might be a better choice than other plastic bottles, particularly if they have been used for plants or to mix cleaning products. Many brands of spray conditioner are recommended for weekly or monthly use to restore needed moisture and help repair split ends. 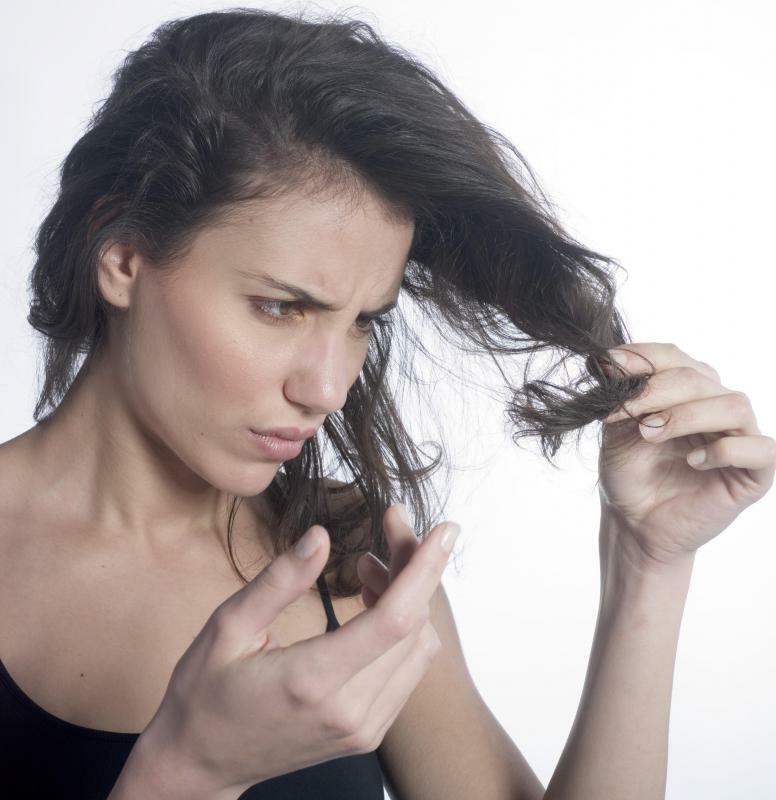 Some types may even be okay to use on a daily basis, but the hair can sometimes appear to be greasy when it is used too frequently. After several uses, some conditioners can leave a build-up or residue on the hair, which can usually be removed with a clarifying shampoo or by rinsing with a baking soda and water mixture. Although spray conditioners can be applied at a salon or spa, they may also be used at home. Most individuals do not normally have a reaction to using this product, as long as they do not have any scabs or open sores on the head. People with such conditions may want to forego the use of this product until these lesions have had an opportunity to fully heal. This product can be an important part of a haircare routine. This can be especially true if a person has very dry or brittle hair. Also, regular use of a spray conditioner may be effective in preventing future damage from hair appliances, sunlight, or chemicals. How Do I Choose the Best Volumizing Hair Spray? How do I Choose the Best Moisturizing Conditioner? What is a Thickening Conditioner? How do I Choose the Best Detangling Conditioner? How do I get Rid of Split Ends? I don't think it's a good idea to use normal hair conditioner to make a spray leave-in conditioner. Regular hair conditioner is meant to be rinsed, it's not suitable for leaving in hair. So like the article said, there will be unpleasant residue. And those who have an oily scalp or who have a sensitive skin might experience problems. It could trigger an acne breakout for example. It's best to use products as they are intended to be used by manufacturers. I recently bought a spray leave-in conditioner for the first time. I had been using cream style leave-in conditioners before this. I think I like the spray type better because it's easier to apply and distributes more evenly. With cream leave-in conditioners, I usually miss certain parts of my hair which remain tangled. I think the spray is going to last me longer as well. Everyone using a heat styling tool on their hair like a flattening iron or curling iron must use a protective spray conditioner beforehand. When I first started using my straightening iron, I did not know about spray conditioners. After several months of straightening, my hair became extremely damaged. I had split ends everywhere and my hair would break very easily. Then I discovered spray conditioners made especially for heat styling tools. These not only condition hair but also protect from heat. The one I use makes my hair really soft and it smells so good. The condition of my hair has really improved and I can continue to straighten my hair.